Boys Junior Varsity Wrestling, Boys Varsity Wrestling · Dec 28 Thank you to our 2016-1017 Wildcat Wrestling Bronze Sponsors! 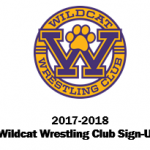 Boys Junior Varsity Wrestling, Boys Varsity Wrestling · Dec 28 Thank you to our 2016-1017 Wildcat Wrestling Gold Sponsors! Boys Junior Varsity Wrestling, Boys Varsity Wrestling · Dec 28 Thank you to our 2016-2017 Platinum Wildcat Wrestling Sponsor!